Jerome bought my series of paintings called "End of World Animals" last year. They are acrylic on cardboard. 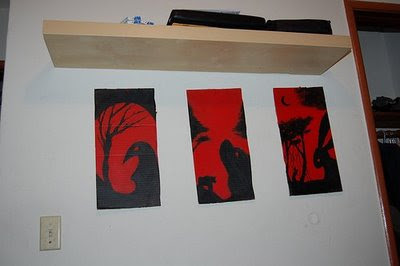 He hung them up and took a picture of three of them. There are five altogether. Four are red and one is green. There's a crow, a bear, a rabbit, a squirrel, and a deer. I like the way my artwork looks on other people's walls. A lot of people have been calling me legend lately. At first I kind of liked that. I am a legend in my own mind. Do you have to be dead to be a legend? Jack Morgan = LEGEND ?